It's 1995; I sit in the stands of Yankee Stadium and close my eyes. I listen carefully as the umpire shouts the familiar words "Play Ball!" As I allow this term to penetrate my being it's not hard to imagine 1958, "the good ol' days," a time when players and fans alike came together simply for the love of the game. Taking in the true essence of "The House That Ruth Built" I can almost hear this benchmark term echo throughout stadiums across America. This tradition, signaling the start of "America's favorite pastime" has not changed but everything else has. Sadly this reality encompasses all sports and any realm that potentially lends itself to the birth of a hero. Looking around, things seem familiar, comfortable, good; families gather for an evening to watch their "heroes" take the stage. Upon closer inspection something, everything has changed; for now, it is 2011, a lifetime away from the world the baseball players of 1958 knew when they graced these "sacred" grounds. Looking back at a baseball roster for 1958, the names hit hard like the crack of the bat when Boston's Ted Williams hit the 17th grand slam of his career. Heroes one and all were playing for what would now be considered meager salaries. Their true wealth was their legacy— for these are the names that will live in our hearts forever. Sadly, I understand those days of fun and innocence are long gone. Today's athletes play their respective sports very well (both figuratively and literally) causing a direct impact on the nature of these games and how we choose our heroes. Once upon a time, a hero earned his or her title. Back then we too thrived as individuals and as a culture. Today with the collapse of morality, when our president personally phones Jeffrey Lurie (owner of the Philadelphia Eagles) to congratulate him on giving convicted dogfighter Michael Vick "… a fair second chance" we find ourselves in a sorry state and it's time to rework "humanity's code of ethics". 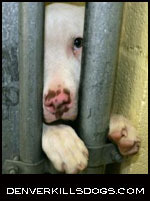 Those who choose to forget Vick's actions mirror who and where we are in today's world. Children lacking proper role models suffer from the inability to know right from wrong (particularly while their parents sit in the stands and cheer for criminals). 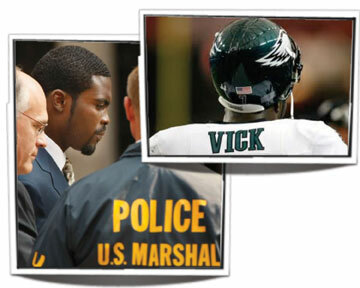 In April 2007, Michael Vick was implicated in an illegal interstate dogfighting ring that had operated for over five years. In August 2007, he pleaded guilty to federal felony charges and served 21 months in prison. Court documents show Vick personally participated in killing dogs; some were hanged, some were drowned, some beaten to death (their bodies slammed against cold concrete floors breaking their backs) and some were electrocuted. This is not the simple thuggery that so many of Vick's peers (and their fans) consider to be part of the normal trappings of today's sports culture. Nor is it the occasional sensationalized celebrity misdeed over which we secretly thrill. These casual, habitual and routine brutalities would brand the average person insane. My question: Why should a society be allowed to grant forgiveness on behalf of the murdered? HOW a society can forgive reprehensible actions where the victims are so pure, so innocent and the crime is so heinous is unfathomable. Our society is divided when it comes to forgiving Michael Vick. WHY remains a mystery to those who abhor Vick's actions at Bad Newz Kennels—Vick's personal "house of (canine) horrors". While it is quite obvious that forgiveness comes easy for those whose conscience has been replaced by "big bucks" it remains perplexing how others not only forgive but heroicize a member of a deviant subculture whose mental constitution is the makeup of a sociopath. According to actress and comedian Whoopi Goldberg, Vick should be forgiven because of his "culture". Ms. Goldberg defended Vick on the television show The View stating; "from where he comes from (in the south) dogfighting is not that unusual, for many people, dogs are sport". Goldberg continued, "there are certain things that are indicative to certain parts of our country". Goldberg surmised Vick's actions were a result of the mindset behind those he encountered while growing up. Flash Forward… Vick had been playing for the Atlanta Falcons for six seasons before he was caught and admitted to federal criminal charges. It was during this time (while employed by the NFL) that Vick decided to moonlight as a dogfighter. The fact that he traveled in "certain" circles and lived "the life," (Vick's culture had drastically changed) could be one retort to Ms. Goldberg's ill thought remark; another, stating culture to be the cause for a person to act as a deviant is not only a cop-out but is ignorant and insulting. Some acts can be forgiven and some not. Recently, Oprah Winfrey interviewed Dr. William Petit. Winfrey asked Petit if he could forgive the men who brutally tortured and murdered his entire family, setting his house on fire (while he lie on the basement floor unconscious). Waiting for Petit's answer, I silently repeated, "NO, please, do not let him forgive". I wanted to cheer when this husband and father of two stated a firm NO in response to Oprah's question. 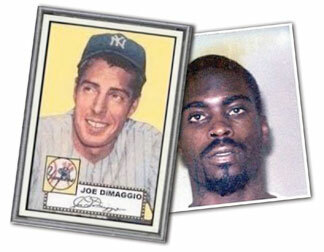 In this day and age when an actress can gain notoriety through sexting, when the distinction between heroes and criminals are virtually non-existent, when deviants get to play a game for millions of dollars, when our nation's eyes are truly lonelier than ever (collectively we might wonder) "Where have you gone Joe DiMaggio….?"